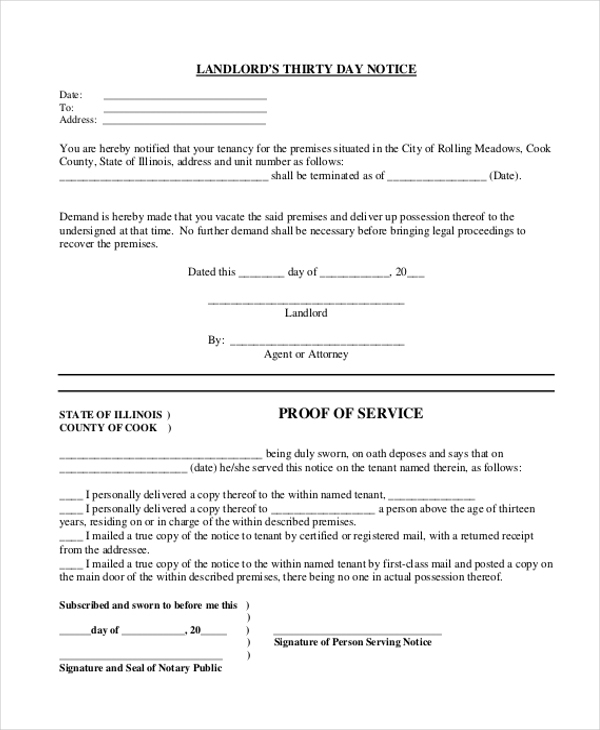 A 30 day notice to the landlord is a notice sent to the landlord with the intention of ending the periodical agreement by the person who is renting the place. A 30 day notice should be sent to inform the landlord that the renter would be leaving the place in a period of 30 days, and therefore the landlord should take necessary measures to handle the situation. 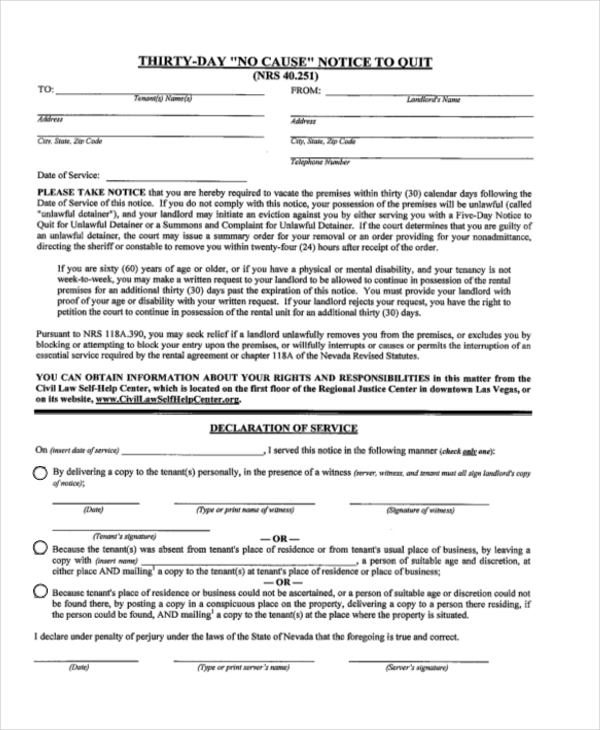 This is a Notice Forms, which requires all formal details with a valid signature. This 30-day notice to landlord has the conditions and terms of the lease you are signing for and how you will maintain your apartment and belongings and the instructions notified. You need to sign a 30-day notice before you vacate. For the same, you will sign a form given by the residential landlord. Also, a landlord may terminate the tenancy by giving a notice. You may also see 30 Day Notice Forms. In order to terminate a lease or tenancy, in accordance with ORC, you will be signing a notice of termination and specify the days since when you vacate the premises. 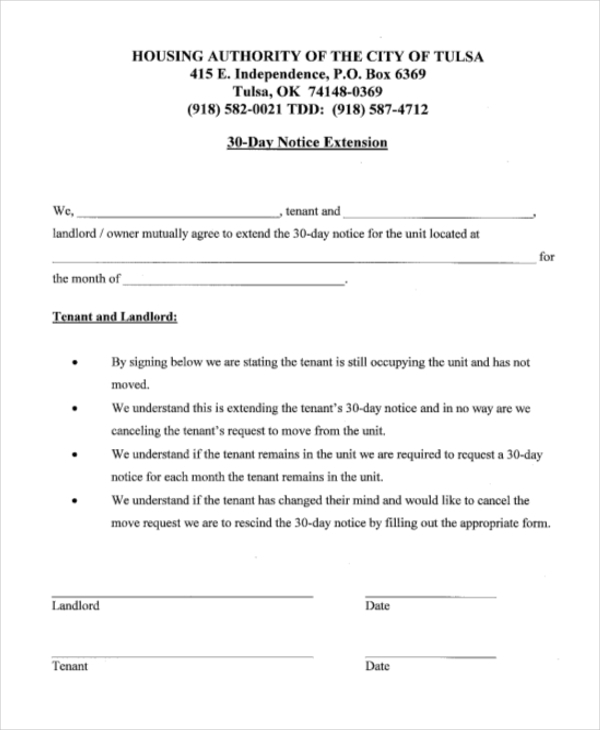 This 30-day notice to landlord is given as a proof that you are vacating the premises on the specified date and the landlord approves of it by signing this 30-day notice. 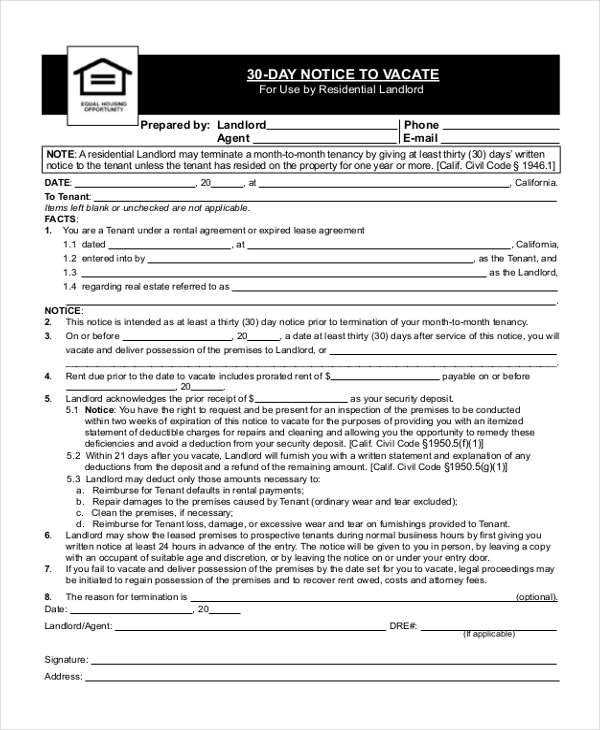 This tenant 30-day notice to vacate to landlord form contains of all the information regarding the tenant. This must be signed by all the people included in the lease form. 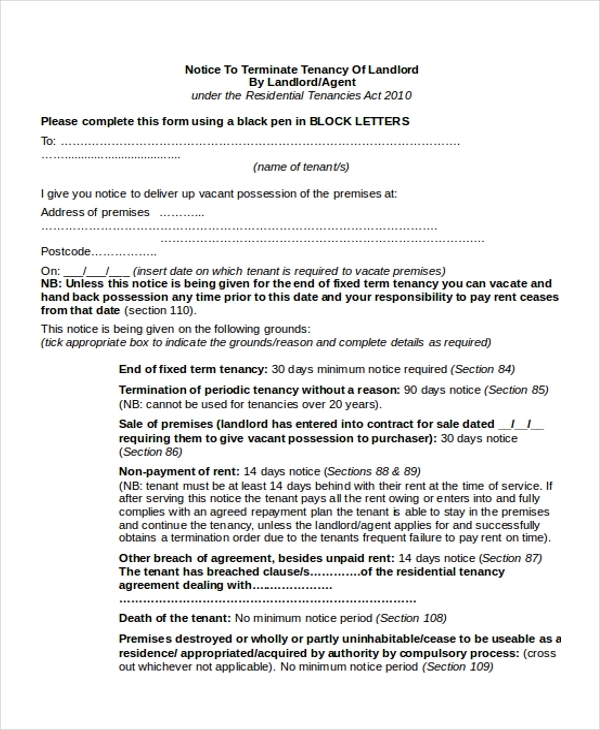 This form, just as the name says, helps the tenant to extend another 30 days after the notice period given already. 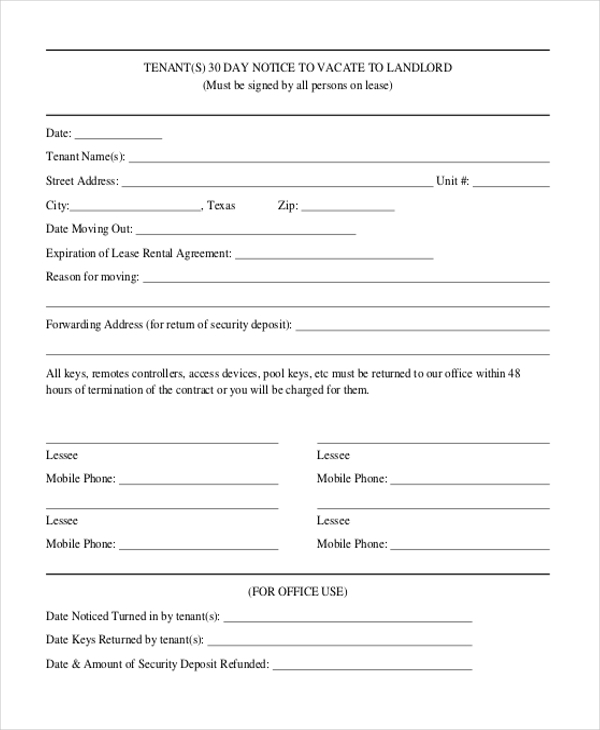 This form mutually agreed and signed by both the tenant and landlord or owner. 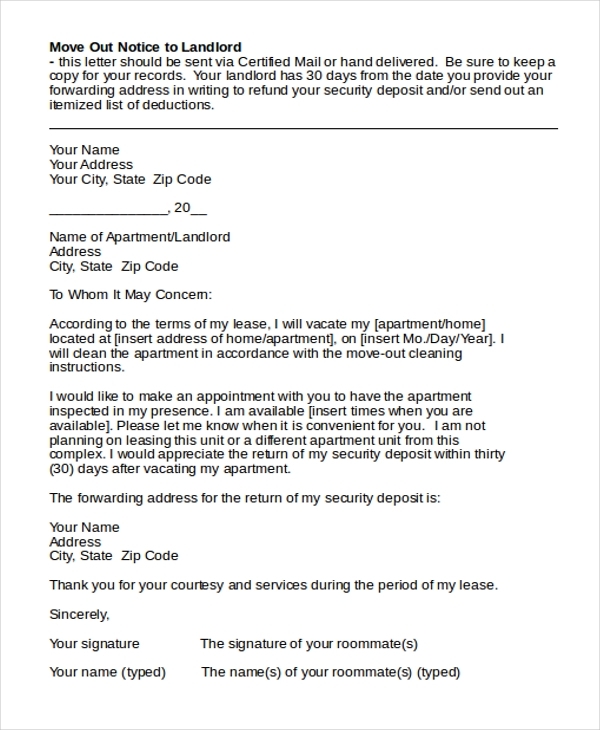 This form is signed to document the move out date and these 30 days can be used by both ends in the process of refunding your security deposit and send out the list of deductions if any. After signing the notice, the tenant is required to vacate the premises within 30 calendar days from the date of signing. If not, the possession will become unlawful for the tenant. The target audience for this 30-day notice is usually only the tenant and the landlord. In certain cases, all the persons that are included in the lease will also be required to sign the form and terms and conditions included in the form will be applicable to all of them. However, this happens only with a few situations. The tenant and the landlord is expected to go with the terms and conditions specified and not abiding by the same is going against the law. You may also see Notice to Vacate Forms. What are The Benefits of 30 Day Notice to Landlord? A 30-day notice to landlord is beneficial for those who want to get to know a neighborhood or the landlord before committing to a long term lease. This notice enables the tenant to formally inform his/her problems to the landlord so that the vacation would be at ease. Also, having a notice will also ensure that the dispute doesn’t occur between the landlord and the tenant either on a legal or a financial note, which could cause a break of a long-term lease. You can also see Eviction Notice Forms. The 30 day notice to the landlord is completely mandatory to be sent to the landlord. If not, legal actions can be taken, and the payment of the rental amount should also be done efficiently. The notice to vacate form is precaution measure taken on the tenant’s side – to avoid mishaps and thus, facilitates the process of vacation without any misunderstanding on both the sides. 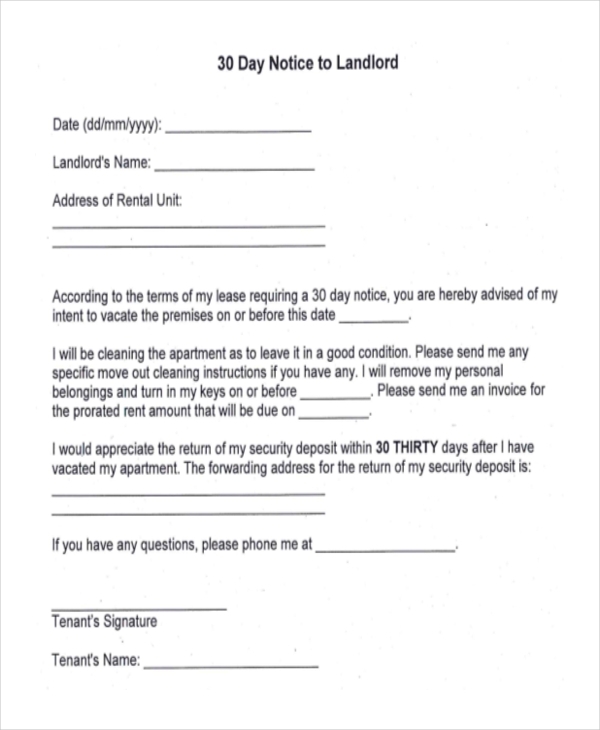 30 day notice is the information to the landlord from the tenant about his moving out.